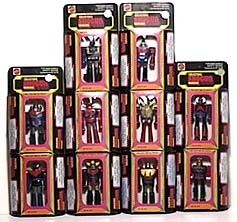 The initial release featured six Shogun Warriors: Combatra, Dragun, Gaiking, Grandizer, Great Mazinga and Poseidon. 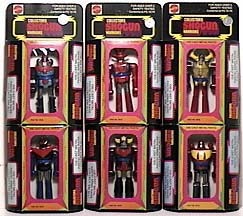 The second release added Dangard, Leopaldon, Voltes V and 17 (Daitetsujin 17 in Japan), and re-released the initial six with different boxes and box back graphics. 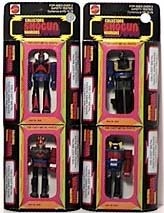 These back box graphics are the main difference between initial release and second release Collector's Shogun Warriors as there was no change in the figures. I've seen three box variations: a thin box that is just slightly larger than the figure with a header for hanging; the same box mounted on a wide card for hanging, and the wide boxes shown in my pics below. 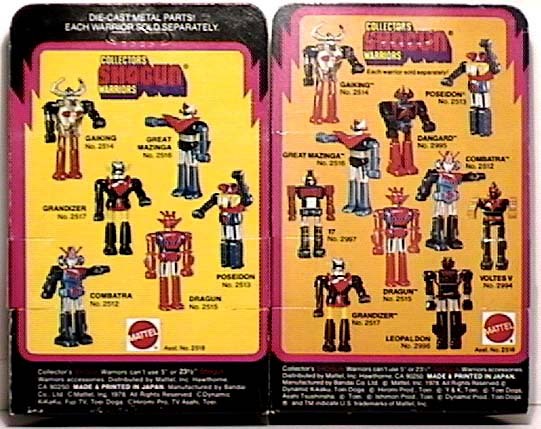 Many of these figures were later released as Mini-Godaikins (there is virtually no difference in the actual figures (GoDaikins have "Taiwan" in stead of "Japan" embossed on them an also are covered with metallic decals) and due to this confusion, prices on loose figures vary tremendously). 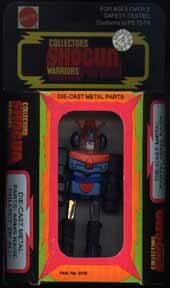 The 3 1/5" tall combattra has a colorfully painted (in red and blue) metal torso with plastic head, legs and arms and is typical of the rest of them. Combattra is often confused with Voltez V because of the "V" on his forehead but his large bowl-shaped ears and antennae (which are usually missing on loose examples) are prominent identifiers. Measuring at slightly 3", Poseidon has a yellow, red and blue painted torso with plastic appendages. He may be identified by his treaded forelegs and red shoulder-mounted cannons. Gaiking is my personal favorite of the 3" collectors Shoguns. His heavy gold-painted die-cast torso is wonderfully shaped into a skull. 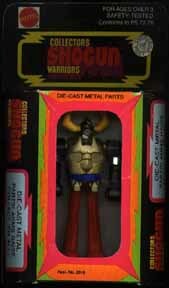 This red plastic legs, black arms and large yellow horns all jut out in odd angles from this nearly 4" figure. This nearly 4" tall figure has red plastic limbs and head attached to a red and blue painted body. 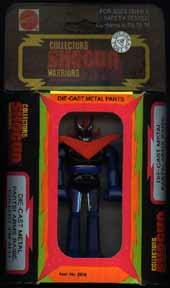 Mazinga may be identified by his black torso with blue plastic lims. His skull shaped head has several horns projecting from it. A large red plastic "v" projects from his chest. 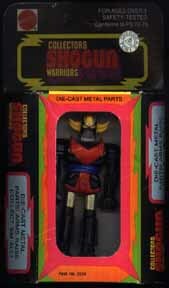 This 3 1/5" tall Shogun has a black and red painted torso with black plastic limbs. His predominent feature is the double yellow horns on either side of the head. 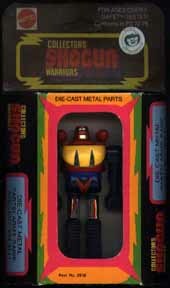 At slightly over 3", Voltez V is one of the smallest Collectors Shoguns. 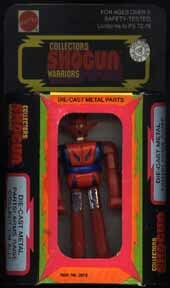 He has red plastic arms and black plastic legs, attached to a black and red painted body. His red plastic head looks like a plane or spaceship. He does not have a "V" anywhere on his body. Dangard may be identified by the red arrow shapes on his body. His chest and legs have upward pointing red arrows, and his head has wings for ears with a forward facing plane canopy for a forehead. 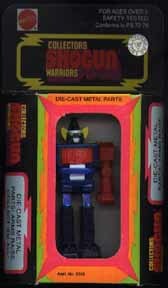 His metal torso is painted black, red and blue. Leopaldon is the Spiderman robot in Japan, and the toy reflects this with the spiderweb motif on his chest and legs. 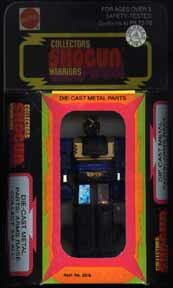 The metal torso is painted gold and black, while his arms are made of blue plastic and his legs are black plastic. 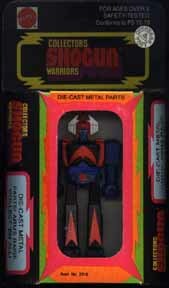 One of the more difficult to find in the Collectors Shoguns, "17" is less thatn 3 1/5" tall, has a red, white and blue painted metal torso, and has a winged conical head (sort of like a plane or spaceship). 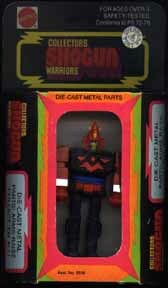 His arms are molded of red plastic while his legs are black plastic. He has the number "17" embossed on his chest in red.